Jib Cranes can become slightly confusing when it comes to making your first purchase as factory management it is your responsibility to ensure everything goes to plan, so reading this article will help you get to grips with Swing Jibs and ensure you pick the right one! Firstly there is the type of Jib Crane, will you be floor mounting or wall mounting? Free Standing- When specifying a free standing jib crane the jib arm is supported by a floor mounted support, this is secured by chemical anchors that are fitted to the ground and base plate. These can be over-braced or Under-braced, if headroom issues are bound to occur (meaning you do not have enough room above the jib arm to fit the crane) under-braced ensures that the total height of the crane is no taller than the required hook path (height of lift). Wall Mounted- The name is self explanatory, easily mounted to a wall using fixing stirrups or chemical resin anchors, giving more room on the floor of the production line. Additional height of lift can be achieved at a better cost without the need for tall columns for mounting. 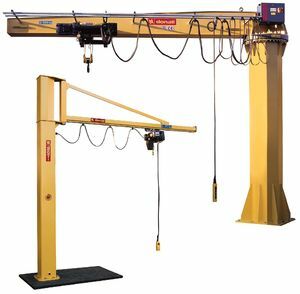 Jib Cranes can have up to 360 degrees of manual or electric slew in order to efficiently and effectively reach material and lift up to 10 Tonnes. For more information and competitive quotations on Donati Swing Jib Cranes please visit Crane Handling. This entry was posted in Business & Lifting Equipment and tagged Cranes, hoists, industrial cranes, jib crane, jib cranes, lifting equipment, lifting solutions, overhead cranes, swing jib. Bookmark the permalink. This post will really help to ensure that nothing goes wrong while purchasing a jib crane. Hope i had known these tips earlier. Thanks for posting !! !